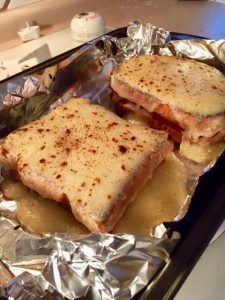 It is said that the Croque monsieur was invented by mistake. 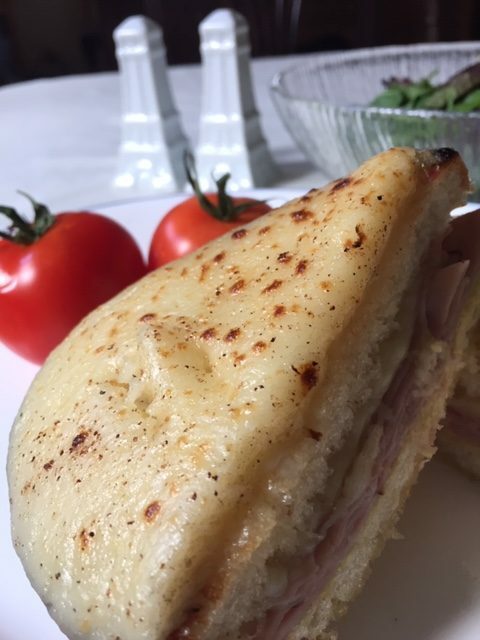 It was discovered in the early 20thcentury when French factory workers left their ham and cheese sandwiches on hot radiators while they worked and returned to discover a delightfully melted combination when it came time for lunch. 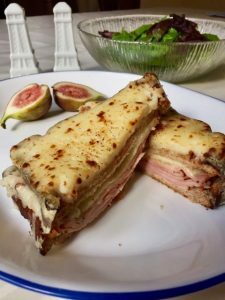 By 1910 the Croque monsieur (from the verb “croquer” meaning to bite) started appearing on restaurant menus and the French have been enjoying variations of this comfort food ever since. To be equitable, they also created the “Croque madame” which adds a fried egg supposed to resemble an old lady’s hat. A disgusting idea from a culinary standpoint as far as I am concerned. 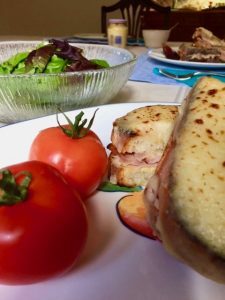 And I feel I am entitled to say so as I have a fair history with the mighty “Croque.” I lived on them as a young exchange student and teacher in France. They were slightly different in each restaurant but always hot, satisfying and most importantly cheap! 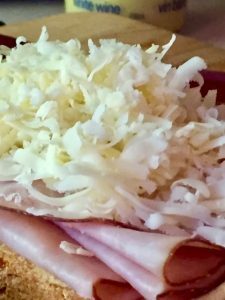 Anyway, at this time of year, I crave a Croque. And instead of ordering one as I usually do, I decided I was going to make one. 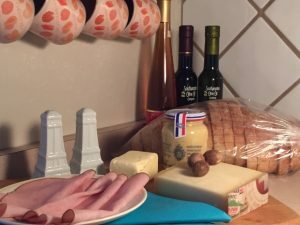 So welcome to the first in my new series that I am calling Diana’s French Recipe Test Kitchen, where I will attempt to make some French dishes. I am not much of a cook so my theory is if I can do it, anyone can, and of course I relish your input. 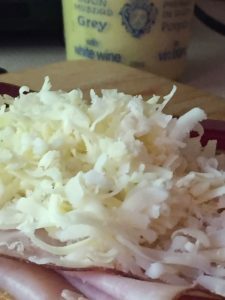 It took me a while to find a recipe that I like but here it is, along with these pictures that I took as I went through the process. I was religious about using only Gruyère Cheese, not Emmental, which is not as strong in flavour. I did one sandwich using crusty white French bread, but I also did one with brown bread and I kept the crusts on. A real no no as but I prefer them that way. 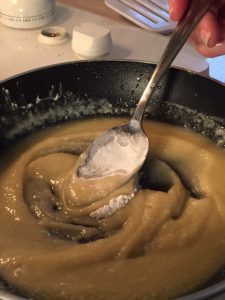 Make Béchamel first: In a small frying pan, melt butter and stir in flour to make a paste. Then gradually whisk in the milk until smooth. Take off the heat and stir in 30g of cheese until melted. Grate in the nutmeg. 2. 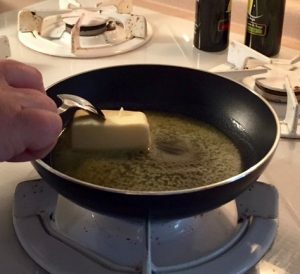 Brush one side only of each of the 4 pieces of bread with butter, and grill under the broiler under golden.3. 3. 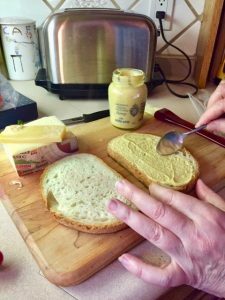 Spread 2 slices of bread on the untoasted sides with Dijon mustard, top with 3 slices of the ham, top with grated Gruyere. Pop under the grill until cheese has melted. 4. Take the other 2 slices of bread, toasted side up, and cover the melted toast slices. 5. Pour the Béchamel over the 2 sandwiches. Grill for about 5 minutes until golden and bubbly. *Do not – I repeat—do not count the calories on this dish! Thanks for posting your recipe. I do love both. When I was 23, I hitch-hiked through France and Corsica and discovered the Monsieur and Madame. Interesting that you don’t think highly of the Madame. Although I loved both, I would often order the Madame, thinking that the egg would be a better choice for a hungry traveller on a tight budget. I’ll have to try your recipe! Another dish I like to eat in Parisian cafés (or some here in Montréal) is a chèvre chaud; a salad topped with baguette slices topped with a specific type of goat’s cheese, harder and drier than what anglophones call “chèvre”, and toasted.